How on earth has it already been a month? 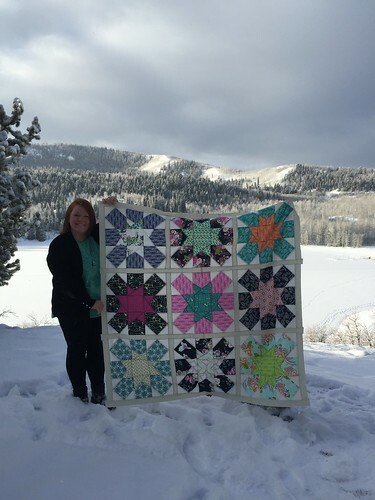 I feel like it took forever for QuiltBliss to come and then now the entire month after just flew by! 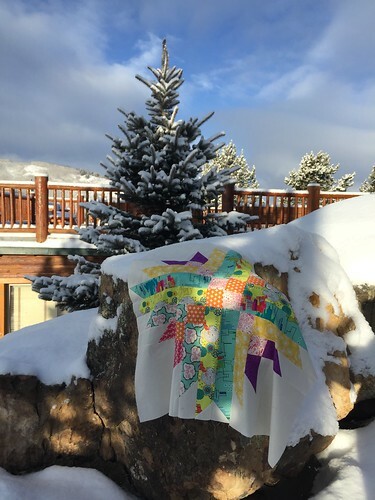 I've been meaning to share my QuiltBliss experience with y'all but really wanted to have my official QuiltBliss quilt finished before I shared. 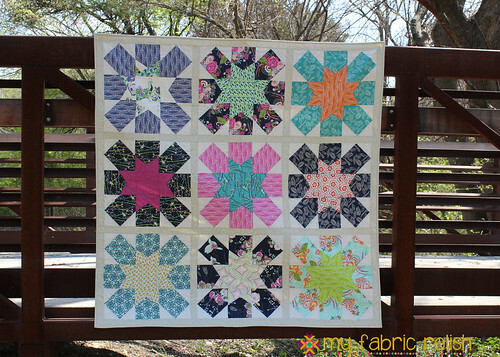 What's so funny is, I actually had this quilt on the frame and quilted within three days of being back from QuiltBliss. Then, it sat there waiting for binding for the rest of March. In my defense, three other quilts were made during this time and they have also been bound and photographed. I've noticed lately that I like to have more of an assembly line of quilts going. It makes it easier to photograph all in one sitting, too! 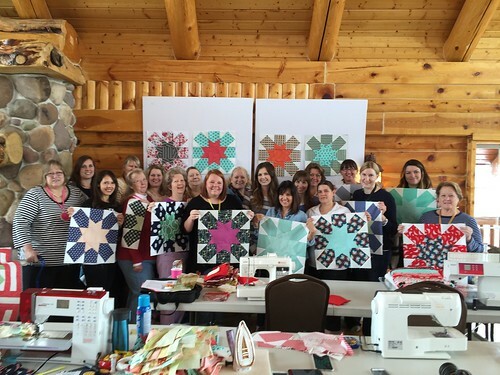 Ok, back to QuiltBliss...I had a wonderful experience last year, but this year was even more amazing! I met so many wonderful women the year before and then spent the following year connecting with them online and so seeing these women again was a completely different, amazing experience. It was really hard to say goodbye this year, because the next time I will see them again is unknown. 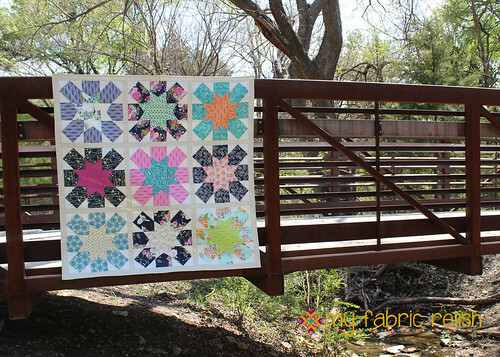 Hopefully at another QuiltBliss, but life changes and nothing is ever certain. Pamela did a wonderful job, once again, and so did all the amazing women that were her team! 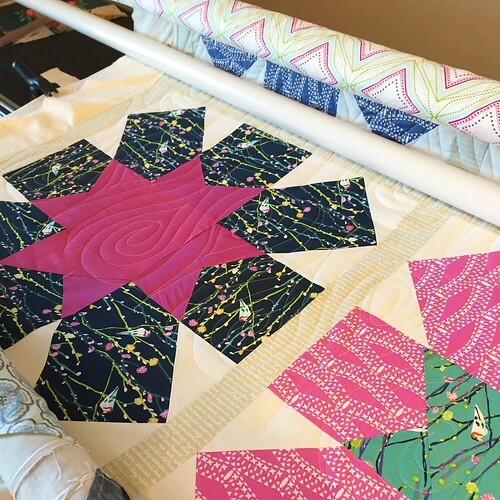 We had some awesome classes this year including fabric dyeing with Jeanette Hartvigson (@misnettamaria on IG) and Saltwater Quilt with Camille Roskelly. CAMILLE ROSKELLY! 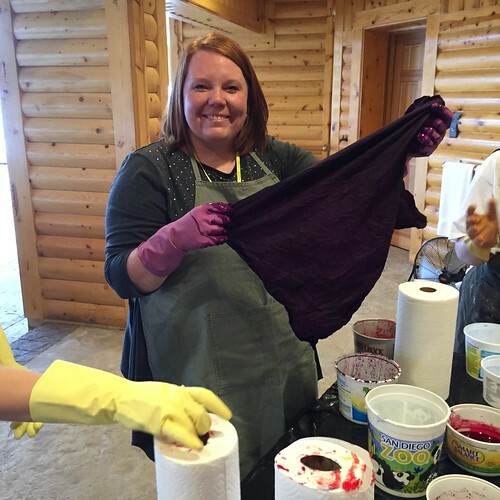 The moment Afton (Quilting Mod) and I arrived at the cabin, we dove right into our first class, fabric dyeing. They offered this class the year before and for some reason I didn't take it. 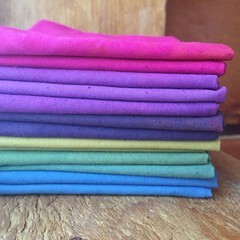 I was so mad at myself once I saw all the beautiful hand-dyed fat quarters being pressed and folded into cute little stacks. Well, I was going to get me one of those stacks this year! Let me just start off saying, hand-dying fabric is not for the faint of heart. It is a lot, A LOT, of work. 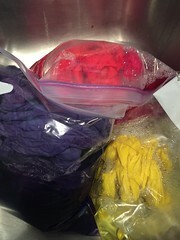 Jeanette made it super easy for us and all we had to do was play with dye in old Country Crock butter tubs! She then took it home and washed it all up and brought them back on Saturday. 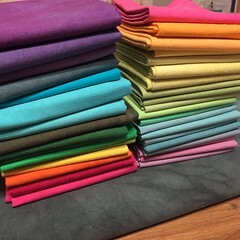 Let me tell you, I thoroughly enjoyed ironing each and every one of these! 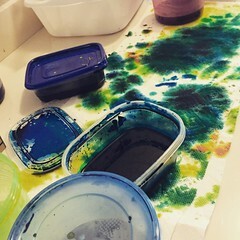 So when I got home, I took Jeanette's instructions, bought some dye (Dharma Trading Co.) and made my own mess! I dyed about 1 bolt of muslin and had a blast! 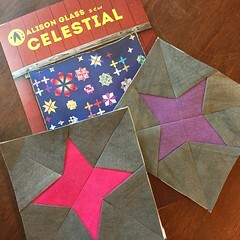 I am using it to make Alison Glass' Celestial quilt first! So excited! I took a couple of other classes inlcuding big stitch hand quilting, color theory, and EPP. I loved all of them, but the other one that I was super excited about was my class with Camille. 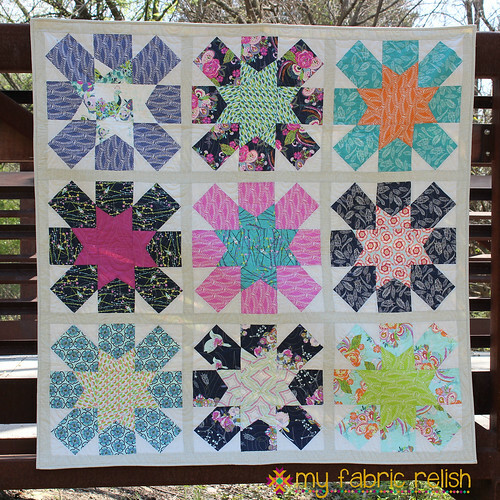 She taught her Saltwater quilt pattern and at first I wasnt sure if it was really a quilt I wanted to make, but then after I picked my fabrics at home and made one block I was hooked! I had also brought a quick project to work on knowing that it would be an easy finish (pattern free on Art Gallery's website). I am so glad I did because it gave me a fast and easy finish to help get my sewing juices flowing. Here is a picture of me and two of the sweetest gals ever, Jennifer (@mrsjbarclay) and Jenny (@jennydespain)! And this face sat across from me and I had so much fun making fun of her accent (She's from O-HI-O) and her making the silliest emojicon faces! Hi Sarah! (@honeyguide). Once I returned home safe and a little sad, I went to town quilting. I decided on a plume edge-to-edge quilting using a pantograph and super happy with how it turned out! I used the same sashing fabric for binding. I am so happy that I have this beautiful reminder of such an amazing weekend! I like that wood-grain design for the Plume Saltwater quilt. It's a nice counterpart to the trees/birds. Love it Melissa! 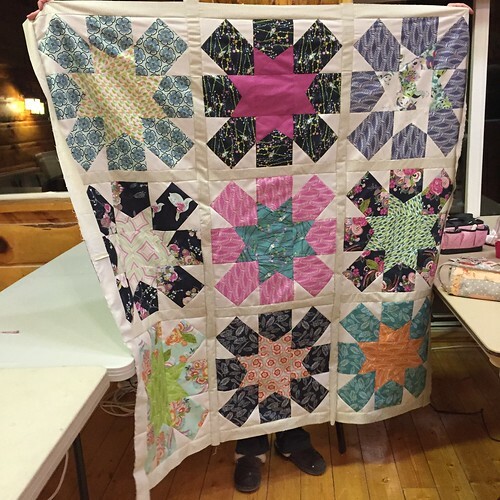 Such wonderful quilting! And it was such a blast to see you again too! 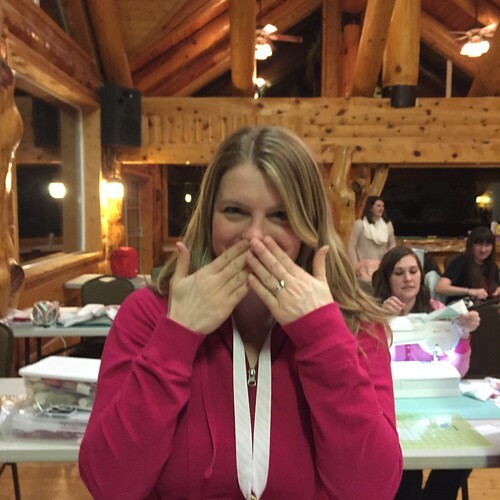 I was really looking forward to seeing you again this year and will be looking forward to seeing you at a future quilt bliss or quilty function! Aww...I had so much fun with you too. We have to meet up to sew again!!! Thanks for not using a really scary picture of me making goofy faces. Lol. What a fun time you had! I'd love to learn how to dye fabric. 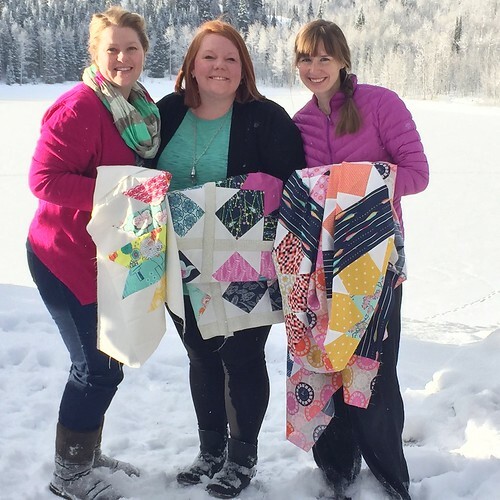 And your quilt turned out so cute. Great finish!